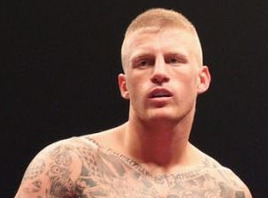 WBA and WBO I/C middleweight champ Patrick Nielsen, 20-0, headlines SPAG´s show in Albertslund (Denmark) November 16 in a defence against Mexican Jose Pinzon, 24-5. Nielsen (pictured), now trained by Joey Gamache, comes in off a career best performance in beating Patrick Majewski. Brother Micki, an unbeaten cruiser, is featured on the undercard, as well as Rashid Kassem and Simen Smaadal. The EE-EU middleweight fight between Vitaly Kopilenko and Sergey Khomitsky that was set for Vraza (Bulgaria) November 16 is cancelled without any reason given. However, the headliner of the bill, EBU superwelter champ Sergey Rabchenko´s defence against Cedric Vitu is still on and the show goes ahead as planned. Newly crowned EBU-EU welter champ Ceferino Rodriguez a/k/a Ferino V makes a voluntary defence of the title December 14 in Santander against Daniel Rasilla in an all-Spanish matchup. Rasilla is not rated even in the EU ratings but will be in the next edition. The Black Panther, former WBC cruiser champ Juan Carlos Gomez is ready to return to the ring November 1 in Dachau and not only that he will return to cruiser where he at one time looked unbeatable. Gomez, 52-3, have weighed as much as 120 kilos in the last few year and have also looked well over the hill. The opponent November is Bosnian Adnan Buharalija, who shouldn´t be any problem for JC even today. Headlining the Dachau bill is the co-promoter and heavyweight Aleksander Petkovic, who face Chupaki Chipindi. 'Skoglund won the vacant EU title on scores of 118-110, 117-110 and 116-112. Mock, teak tough but at 41 not what he once was, was outboxed in the first two but struck whith a big right early in the third and Skoglund fell into the ropes and referee Robin Dolpierre correctly ruled only the ropes kept the Swede up and counted over him - a count that seemed to drag out followed by a long check up before it was waved on. Skoglund was hurt and Mock went all out but couldn´t find the finisher and Skoglund recovered. The following rounds were wild and messy but Skoglund while too eager showed exellent conditioning and in the last rounds he played it safe while Mock kept coming. First true test for Ahlin and he won on scores of 78-74, 77-75 and 77-76 fighting with an injured left hand from the second round and a swollen right from the fourth round onwards. Demchencko was cut in several places and was badly shaken in the sixth but showed a big heart and kept coming and his workrate won him rounds as Ahlin tried to drag him in to land with counters. 80-72 on all cards in a dull fight where Poulsen outjabbed Haidari, who just didn´t get untracked. Salvini soaked up a one-sided beating and it could well have been stopped earlier but in the sixth Giuseppe Lauri finally waved the towel and Salvini was retired. 98-92 twice and 99-91. Keller fought behind a fine jab in the first six with Pryce surprisingly passive. In the last four the Brit came on strong for a good finish but it was too little, too late and Bradley looked too slow. 59-56 Yigit, 57-57 twice. Pace worked hard while Yigit was much more skillful and appeared to have nicked it but the judges went with Pace´s workrate. 60-54, 60-53 twice. Siproshvili came to survive and did that with the frustrated Danish southpaw pushing him down a number of times. 39-37, 40-36 and 39-37 in a fight with not much in it. 80-71, 77-75 and 77-74. Koleva, much smaller, had a point deducted in the fifth for "low head" but had the Swedish Princess in trouble in some rounds. Svensson came on strong in the later rounds for a deserved win. 60-54 twice and 59-55. Jumah, a southpaw, boxed well but got nowhere with Svacina, who was content to survive. WBO 168 lb title, 118-110 twice and 119-111. Four WBC subtitles - Int´l Silver, Med, CIS / SLO, Baltic - at stake on this fight staged by Diamond Promotion. Heard the Arabic title was at stake as well. WBO Youth, 98-91, 97-93 and 95-95. 40-35, 39-36 and 40-36. Lopajovs was down twice. Duhaupas won the vacant EU title after knocking out Rosberg, who came on a about a month´s notice after Richard Towers relinquished the title to go for another title with another promoter. Rosberg was down in the third as well. Hall was floored in the third and he retired between rounds claiming a damaged hand. Rodriguez won the vacant EU welter title by stopping Castellucci. Elyatouti was a very late sub. Aurieng came in as a late sub for Carlos Takam. The vacant WBFed Int´l title was at stake and it was scored 120-108, 119-109 and 118-111.